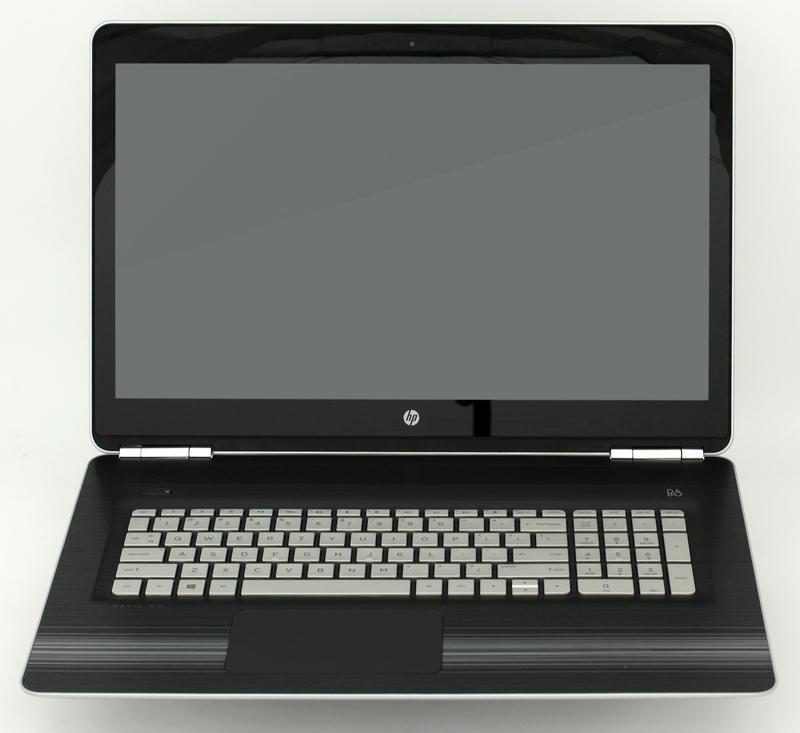 We continue examining the new HP portfolio and the next device down the line is the monstrous HP Pavilion 17 – an affordable and powerful 17-incher that can challenge other, more expensive 17-inch gaming solutions on the market, although it’s not marketed as a gaming laptop. The hardware, however, suggests otherwise so we can easily say that the new beefed-up Pavilion 17 is an excellent multimedia workstation. But that low cost comes at a price you know. Unlike some more expensive rivals, the Pavilion 17 doesn’t excel in portability – it’s hefty, it’s thick and you may want to skip the part with carrying around the device. Also, the cooling system doesn’t seem to hold up during long periods of heavy workload or gaming, so keep that in mind as well. We can’t really complain all that much, though, since the price point of the product offers excellent price/performance ratio without missing some essentials like IPS display (with optional touch) and M.2 support. Here are our thoughts on the product. 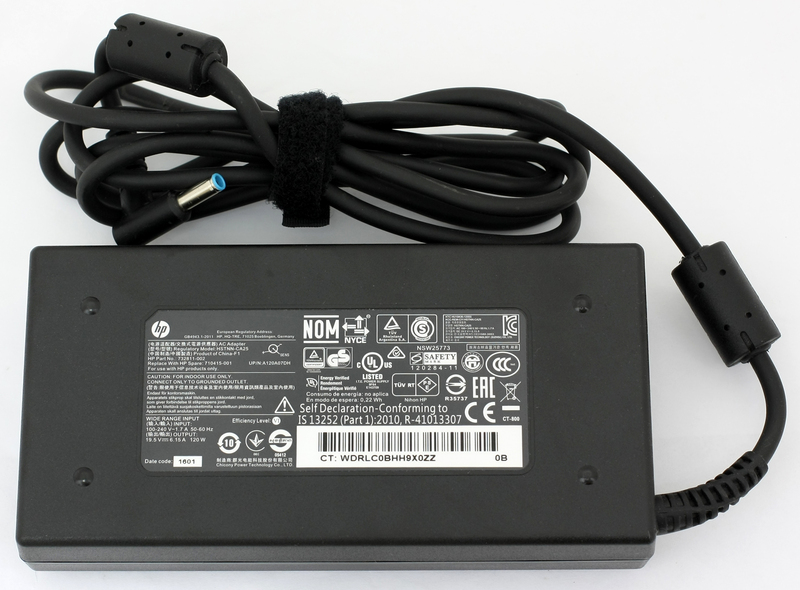 The testing unit we received was in a standard laptop package with the usual AC adapter, power cord and the notebook itself. We can only guess that the end unit will offer the usual user manuals as well. The notebook offers strict and slightly different design – different from its predecessor – but retains the general looks a Pavilion has. It’s generally sturdy and well-built with our only complaint being a little bit too hefty. The non-touch variant is generally on par with the competition but the touch-enabled model that we have weighs around 3.1 kg and that’s almost half a kilo more than some similarly priced products. 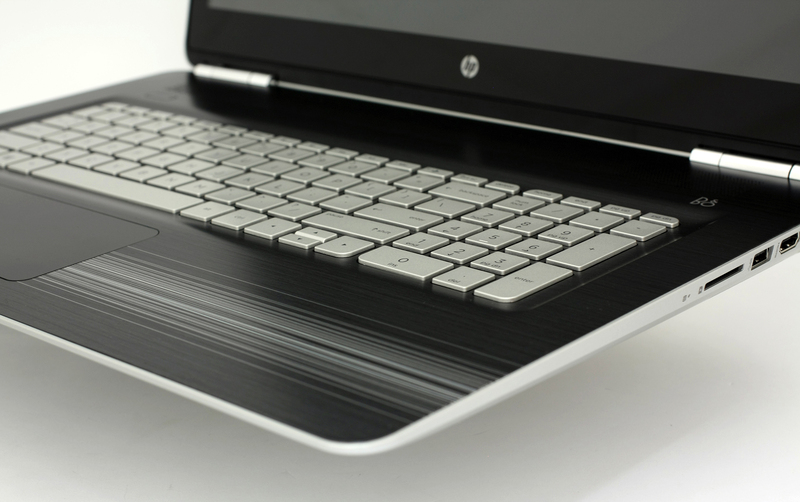 Although, HP’s solution packs way more powerful hardware. Anyway, let’s start with the outer shell. The lid is covered in silver-colored matte plastic similar to the old Pavilion 17 but you can notice that the new hinges are almost completely hidden and aren’t showing as much as before. Speaking of which, the hinges seem to hold the heavy lid pretty well but don’t eliminate that annoying wobbling effect when using the touchscreen. In fact, the screen jiggles enough to obscure normal usage. It’s kind of expected given the form factor and the weight of the product. Still, the lid appears to be well-reinforced and if pressure is applied, the plated doesn’t bend as much. The LCD screen is kept safe at all times. But one thing about the screen, though, those bezels on the top and bottom are way too thick to our taste. Probably some design limitations require bigger lines but we doubt. And as far as the bottom of the base is concerned, it hasn’t gone through major changes and it’s largely the same as before – big grills for extra airflow and user-replaceable battery. The sides are considerably thicker than last year’s Pavilion 17. Measuring at 32 mm at its thickest point vs 27.1 mm on the 2015 model is a big jump in dimensions. Although, we have good port distribution at hand with two USB 3.0 ports on the left and one 3.5 mm audio jack. 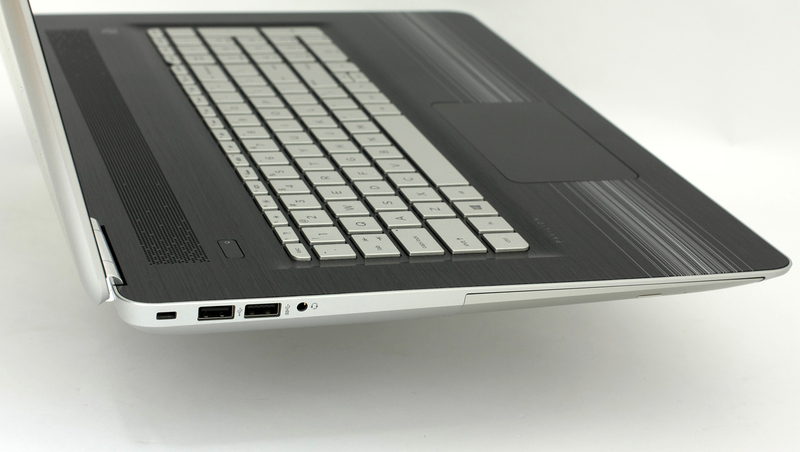 The right side holds the SD card slot, LAN, USB 2.0, HDMI and the DC charging port. At least another USB port on the right side would have been appreciated since this is a 17-inch laptop. 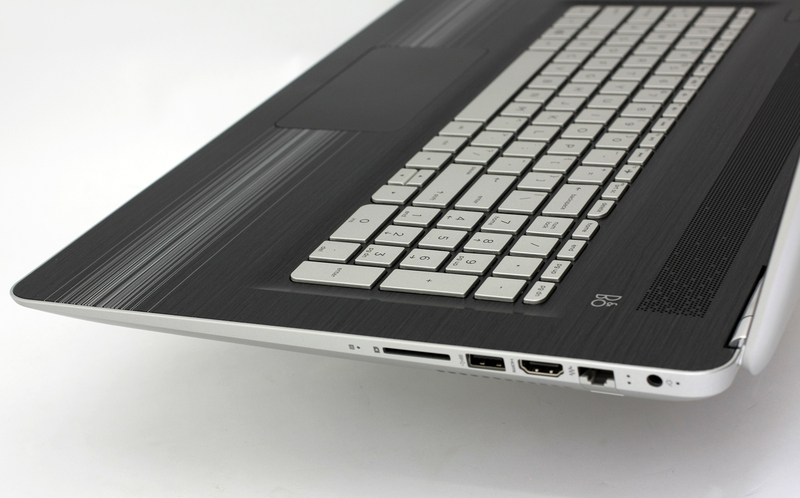 A bigger number of connectivity options are usually one of the perks of owning a 17-incher. Opening the overly tightened hinges reveal a seemingly different interior but in fact, only the pattern makes it look completely different from the older generation. We definitely like the appearance, though. The smooth finish on top looks like brushed aluminum minus the smudges. Fingerprints don’t stick as easily and finish feels nice. The keyboard provides decent travel distance, although we’ve seen much better, with enough spacing and bright LED illumination. 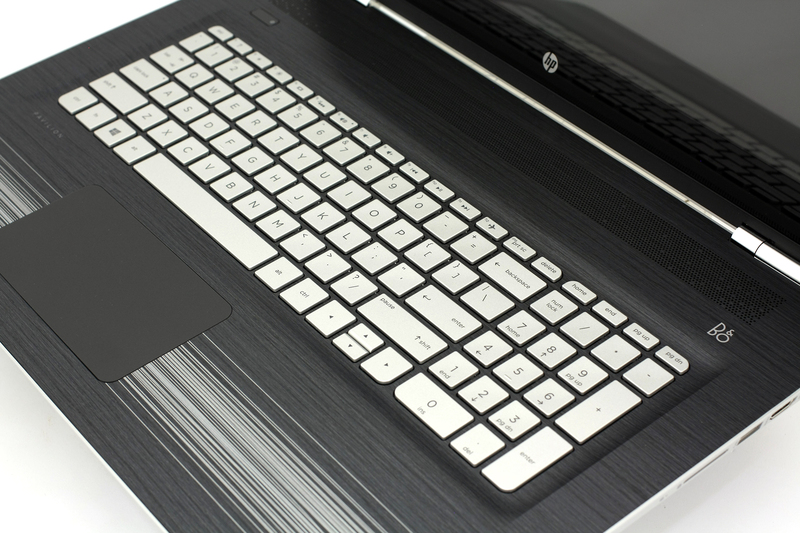 And as before, we aren’t a big fan of the touchpad design. The surface is somehow okay – with a little exception when your fingers are sticky or watery – but the mouse buttons feel a bit too stiff while the accuracy is erratic. 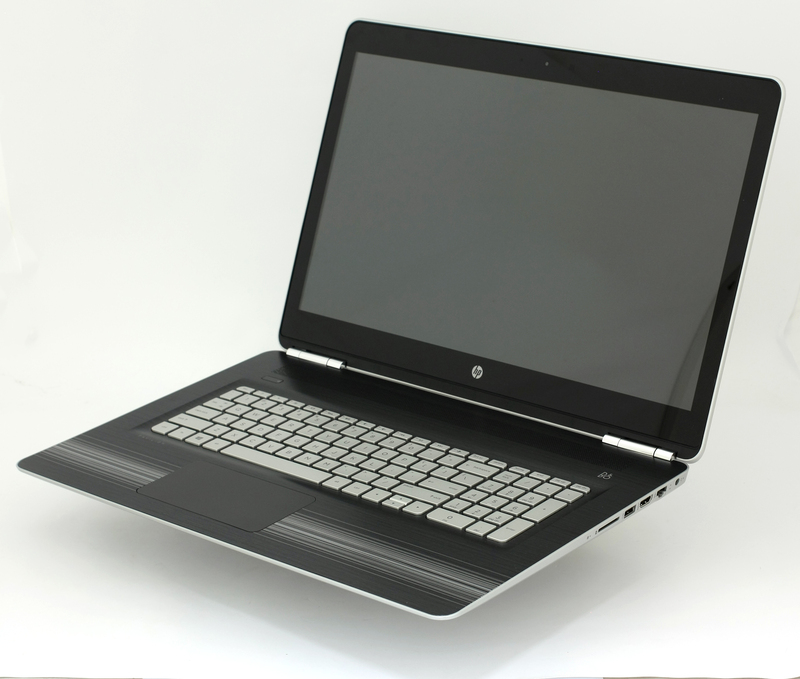 We are generally satisfied with the overall build of the notebook as it provides rigid chassis without any irregularities, gaps or holes. Yes, it may fall behind some of its competitors in terms of mobility and materials – for instance, the N752VX, which is similarly priced – but given the performance/price ratio, the notebook holds up well when it comes to design and ergonomics. The only major complaint would be the stiff and sometimes inaccurate touchpad. 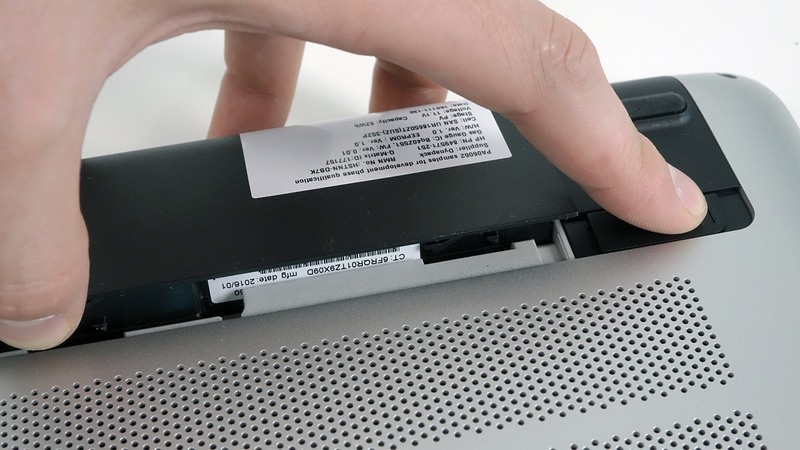 The general maintenance of this notebook is fairly easy and you can access the battery without the need of detaching the bottom piece. 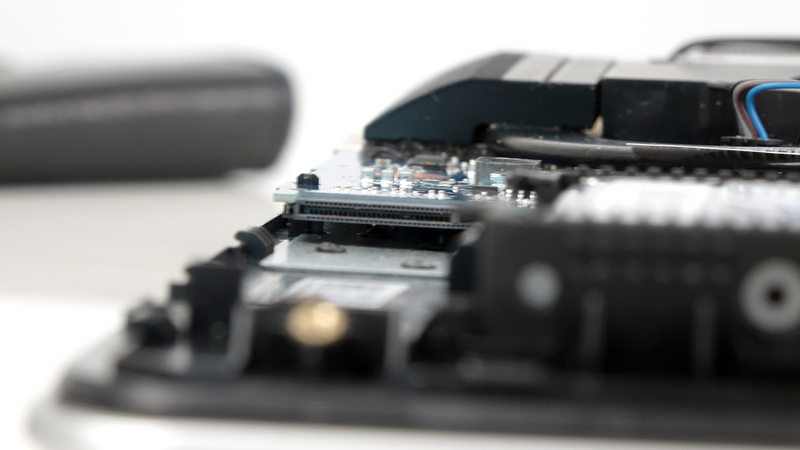 However, if you need to have a storage or RAM upgrade, you will have to go through some unscrewing. 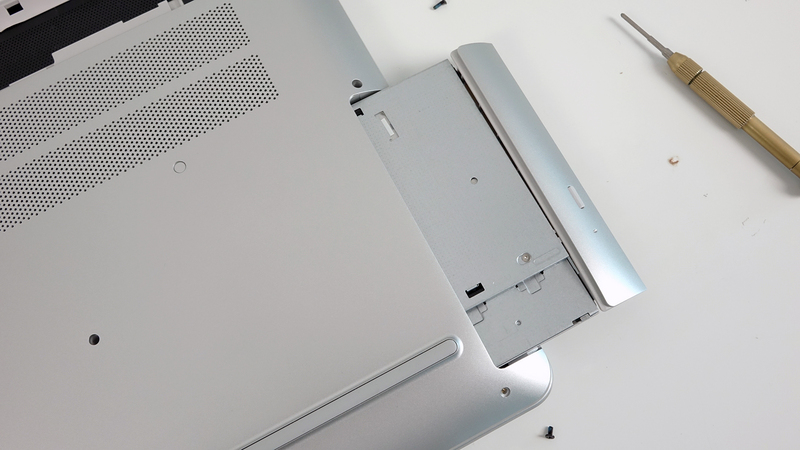 The good news is that it’s nothing like we’ve experienced with other HP models and the bottom piece comes off pretty easily. No hidden screws too, although you need to pop out the optical drive first. 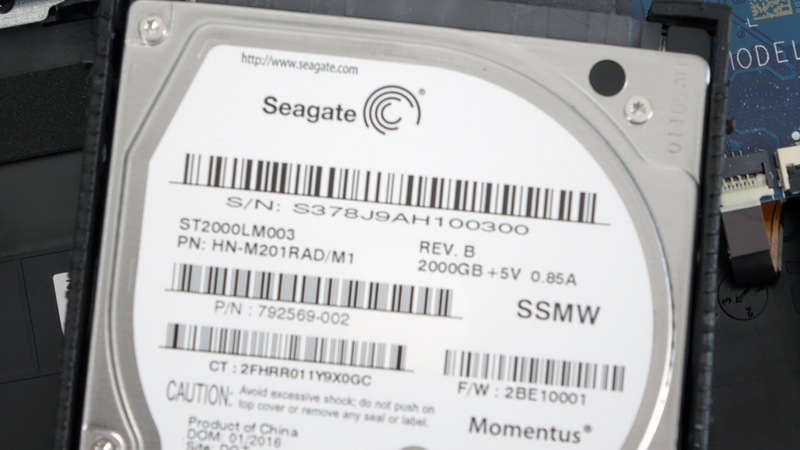 The usual storage setup is at hand – 2.5-inch HDD and an M.2 SSD. The connector supports 2280 sticks with B&M or M-edge keys. Our unit came without an SSD but we tried out if the motherboard supports NVMe but no luck. Only SATA M.2 drives are supported. 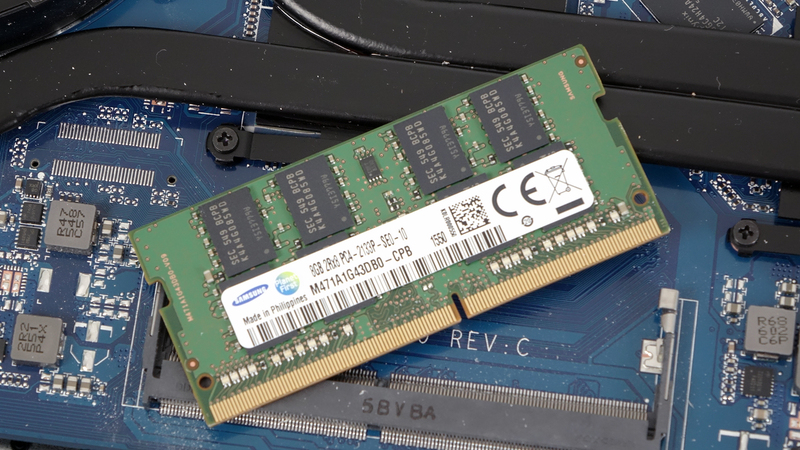 The motherboard supports two RAM slots up to 32GB of DDR4-2133 memory but our unit came with only one 8GB DDR4-2133 Samsung chip. 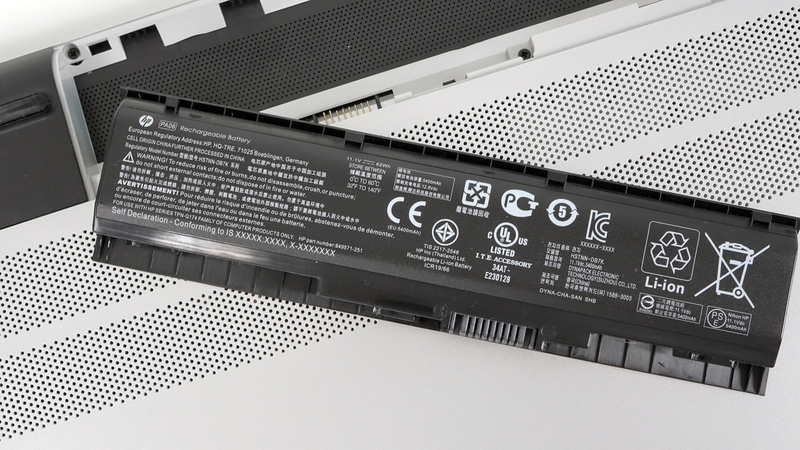 As we mentioned above, the battery is user-replaceable and it’s rated at 62Wh. Both chips, the CPU and GPU, rely on just two heat pipes leading to a large radiator sitting next to a big fan located at the back of the machine. We aren’t sure of its efficiency as the demanding hardware might prove too hot to handle during heavy workload. The notebook we are testing features a Full HD IPS panel with touch panel. 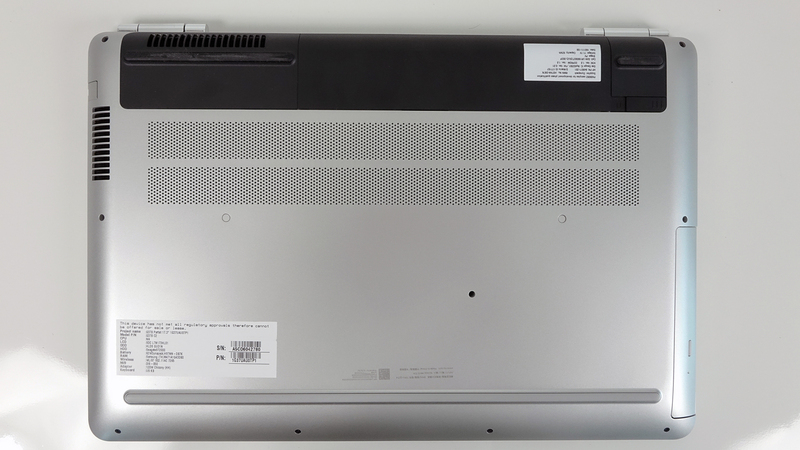 It’s manufactured by Samsung with model number SDC3854 measuring 17.3 inches and packing a 1920 x 1080 resolution. So pixel pitch is 0.1995 x 0.1995 mm and the pixel density is 127 ppi. It can be considered as “Retina” when viewed from ad distance equal or greater than 69 cm. You can see on the microscopic photo below the alignment of the pixels and also the anti-reflective surface beneath the glossy coating. We’ve recorded a maximum brightness of just 262 cd/m2 in the middle of the screen and 251 cd/m2 as average value across the surface. The maximum deviation at this point is 8%. The measured white point is a bit off – 8250K in the middle and 7990K average. Colors will appear a bit blue-ish and cold since the optimal color temperature is equal to 6500K. On the contrary, the maximum color deviation dE2000 is just 2.3 in the upper left corner, which is a good result when you have in mind that values above 4.0 are unwanted. We got an excellent result with 95% sRGB coverage, which cam be seen in the image below – look for the yellow dotted line. 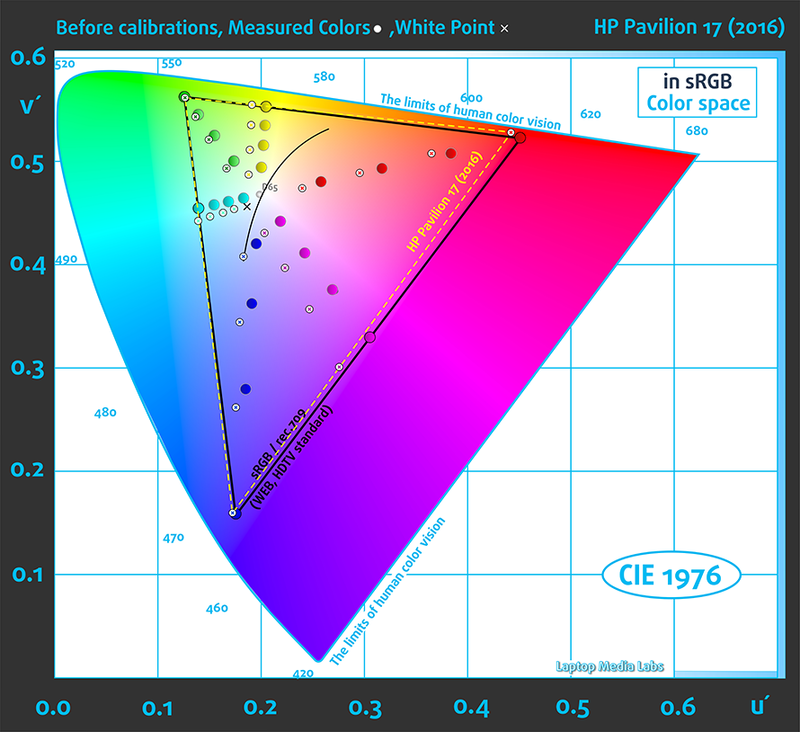 The new profile includes optimal D65 white point (6500K) and sRGB mode. 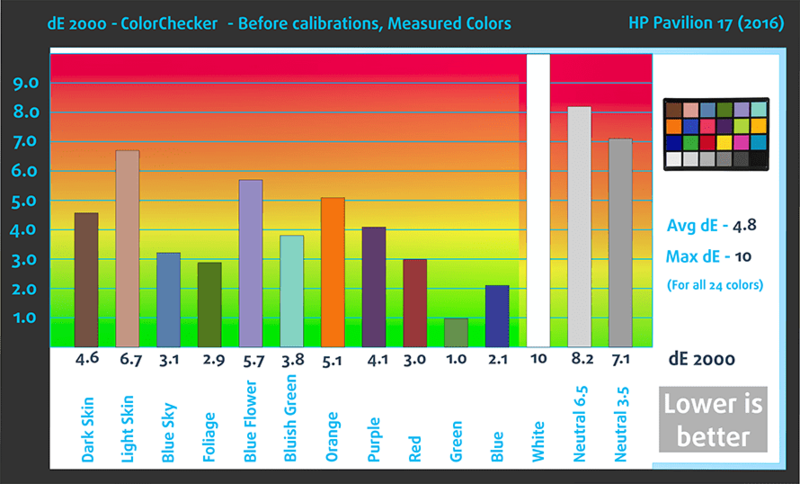 We’ve measured 1000:1 native contrast ratio and 830:1 after calibration. 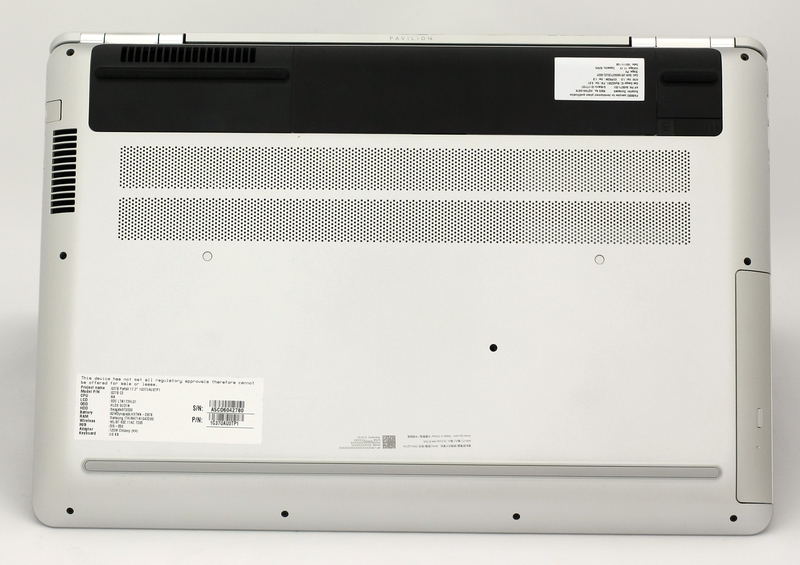 We’ve recorded PWM only at extremely low levels of brightness – 25%, which is around 70 cd/m2. Usually, you will use the display at much higher levels so we consider the display user-friendly. Make sure you keep the brightness slider above 25%, though, as the backlight starts to pulsate aggressively at 200 Hz. The presented Samsung panel here has its pros and cons but the latter are somehow negligible. For instance, the display offers wide sRGB coverage, high contrast ratio, and decent gamma optimization out of the box. We are unhappy only with the native white point, which makes colors appear colder than they should and the maximum brightness, which might obstruct normal usage near a strong light source. 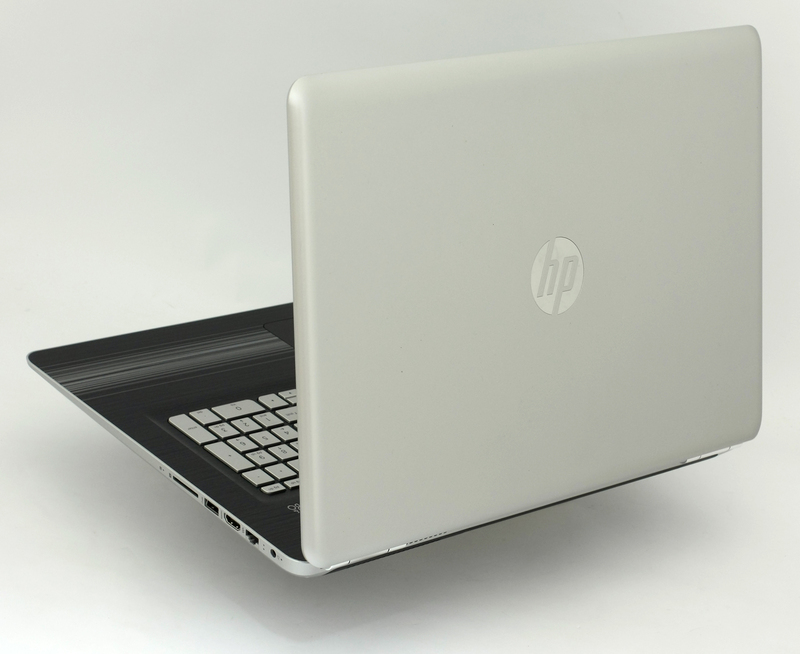 If the notebook is used in normally-lit working environments, however, the lower maximum brightness won’t be an issue. And as for the white point, our profiles help fix that and also bring the average dE2000 from 4.8 down to 0.8! With our Office work / Web design profile, the notebook can be even used for color-sensitive work on the go. And let’s not forget the absence of PWM from 25% brightness and above making the display generally user-friendly. We didn’t notice any major or even minor distortions during music or video playback. The maximum allowed volume is sufficient. The specs sheet may vary depending on your region. 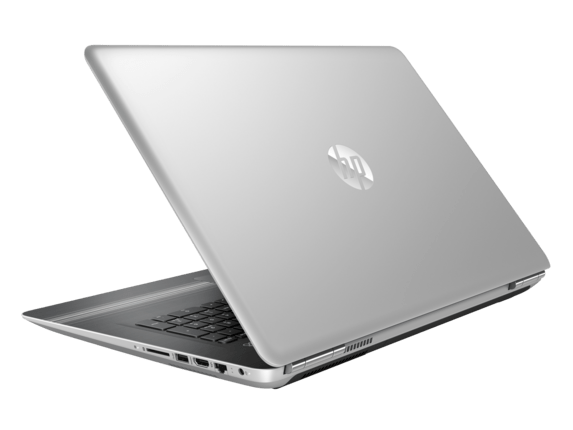 The notebook came with pre-installed Windows 10 (64-bit) but if your’s didn’t and you want to perform a clean install of the OS, we suggest downloading the latest drivers from HP’s official support page. 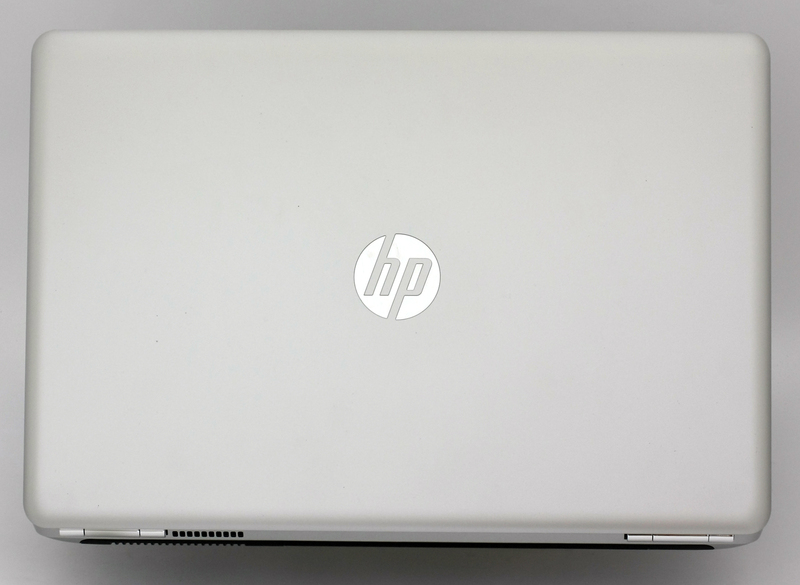 Surprisingly, the HP Pavilion 17 did pretty well in our battery tests especially considering the power-draining Core i5-6300HQ and GTX 960M GPU along with the big 17.3-inch Full HD IPS touch panel. It seems that the 62Wh battery pack was enough to support the system for a good amount of minutes before dying. And, of course, our tests were performed in controlled conditions – Wi-Fi turned on, battery saver mode turned on and screen brightness set to 120 cd/m2. Not a bad result at all – 343 minutes (5 hours and 43 minutes). Almost identical result – 342 minutes (5 hours and 42 minutes). It’s quite unlikely that you will start a gaming session without being close to a power source, but it’s good to know that you can play for about two hours – 123 minutes (2 hours and 3 minutes). Fritz is a chess benchmark that tests the computing capabilities of the CPU with various chess moves. The Intel Core i5-6300HQ managed to get 8.805 million moves per second. In comparison, one of the most powerful chess computers, Deep(er) Blue, was able to squeeze out 200 million moves per second. In 1997 Deep(er) Blue even beat the famous Garry Kasparov with 3.5 to 2.5. This two-staged stress test doesn’t represent real-life situations as the user most probably won’t reach 100% CPU and 100% GPU load for longer periods of time. However, it’s a good way to assess the overall effectiveness of the cooling design and see how the machine handles heavy workload in the long run. We kick things off with 100% CPU load for an hour. 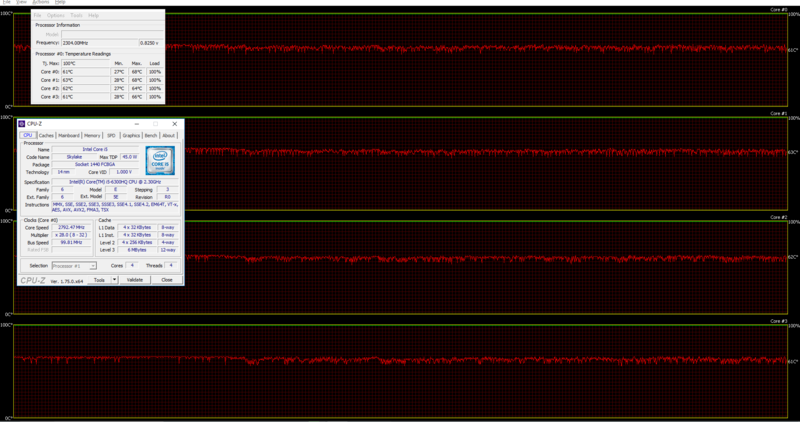 The CPU was running at stable 64-68 °C while utilizing the full potential of all four cores ticking at 2.8 GHz. You can see the red line representing temperatures and the green one standing for CPU load in the graph below. 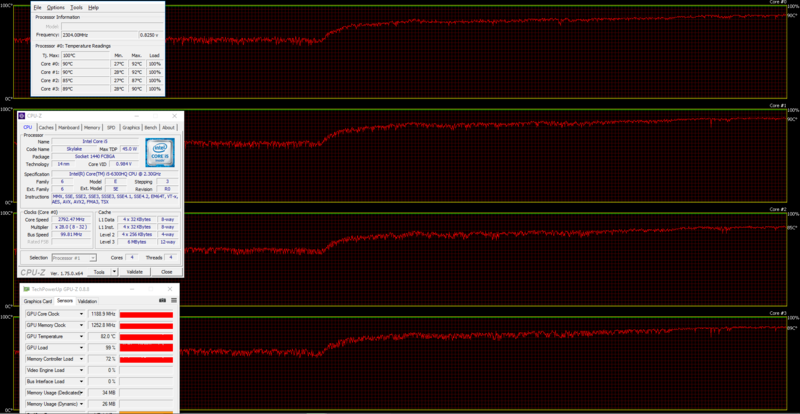 After an hour, we switched on the GPU stress test as well. Temperatures of the silicon did rise to around 90 °C but we didn’t notice any thermal throttling of the CPU or the GPU. Both chips kept running at maximum clock speeds, although the GPU was running a bit too warm – 82 °C. And then again, the extreme nature of the test kind of justifies the GPU’s temperature. 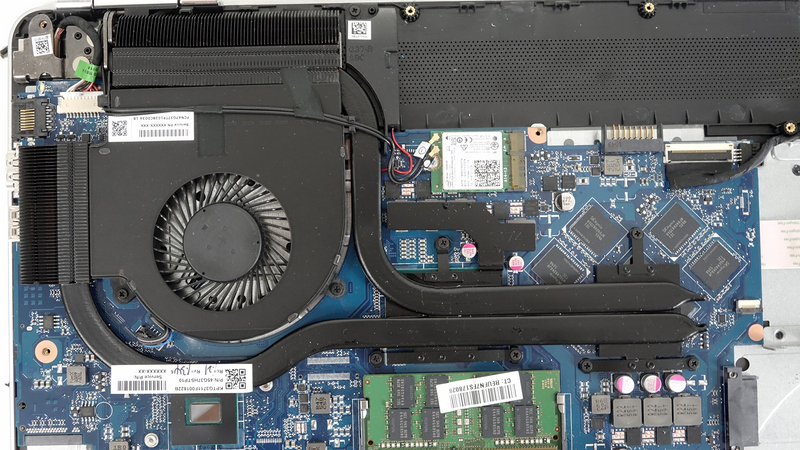 Unfortunately, the notebook’s cooling design wasn’t able to keep the interior cool because the hottest point was around the enter and arrow keys – 46.5 °C. We noticed this particular area to get hot even when gaming. The good news is that the rest of the interior, such as the wrist area, was running cool enough for comfortable use. 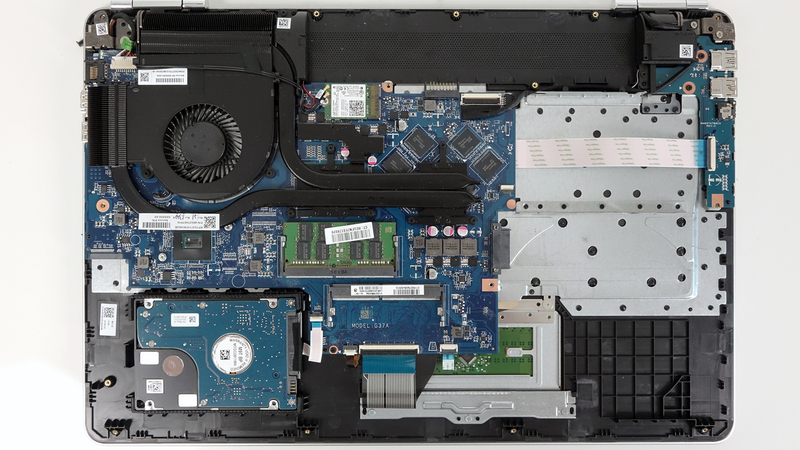 In some aspects, the new Pavilion 17 surpasses even more expensive gaming solutions on the market but in others, it’s hard to compete against multimedia machines like the Lenovo Ideapad 700 and ASUS’ N752VX. One thing is sure, though, it’s one of the finest 17-inch laptops we’ve tested so far solely because of the high-performance hardware and decent display quality fit into a budget-friendly package. On the hardware front, as we already mentioned several times, we have a significant upgrade featuring Intel’s Core i5-6300HQ and GTX 960M GPU as the former can go up to Core i7-6700HQ. Gaming-capable hardware for a price considerably lower than the current 17-inch gaming solutions like the Lenovo Y700 (17-inch), Acer Aspire V17 Nitro Black Edition (VN7-792G) and ASUS ROG GL752VW. 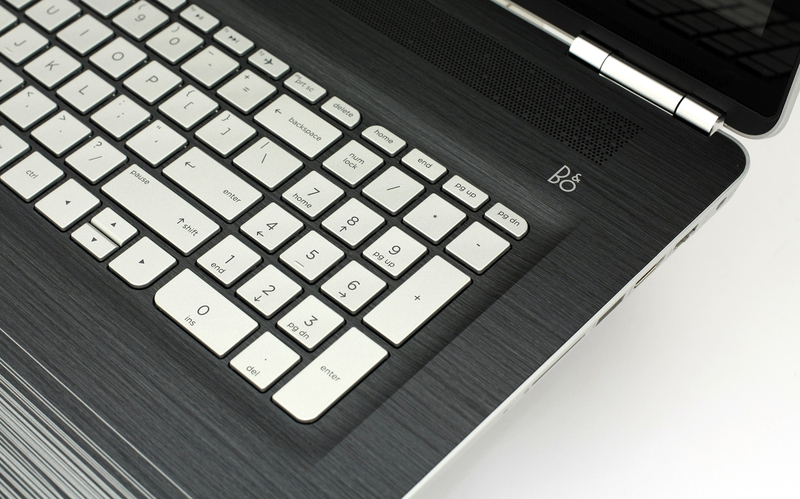 In fact, the Pavilion 17 – the Full HD version with touchscreen – offers better picture quality than the ASUS ROG GL752VW and better battery life than the Aspire V17. Two selling points worth considering for sure. However, the cooling solution seems to fail in one aspect – keeping the heat away from the user’s hands. While the presented thermal design maintains low inner temperatures and stable performance during heavy workload, the center of the keyboard gets pretty warm and the user can feel some of the warmth. Pleaaase I really need to know when the review of the 15′ model will be published. I need to buy a laptop soon and it seems great but I cant buy it without any screen review… Is it decent ? The review will be posted by the end of this week or at the beginning of next week. (: Will try my best. This laptop is a POS. Takes over 2 Windows to start even with 32 GB of RAM and a SSD. Worst purchase ever! Hello, great review as always. Pleaaase I really need to know when the full review of the 15′ model will be published. I have to buy a laptop soon and this one looks great but I need to know if the display is decent ! I really need an answer, thank you. I have bought Hp Pavilion 17 ab003ng version and it uses Chi Mei IPS panel, and clearly displays PWM flicker acorss all brightness levels (100% only flicker free). Also, slight backlight bleed near the bottom and edges. Was not satisfied with that panel. Seems that this samunsg one is much better. Can you please review that model with chi mei panel also ? 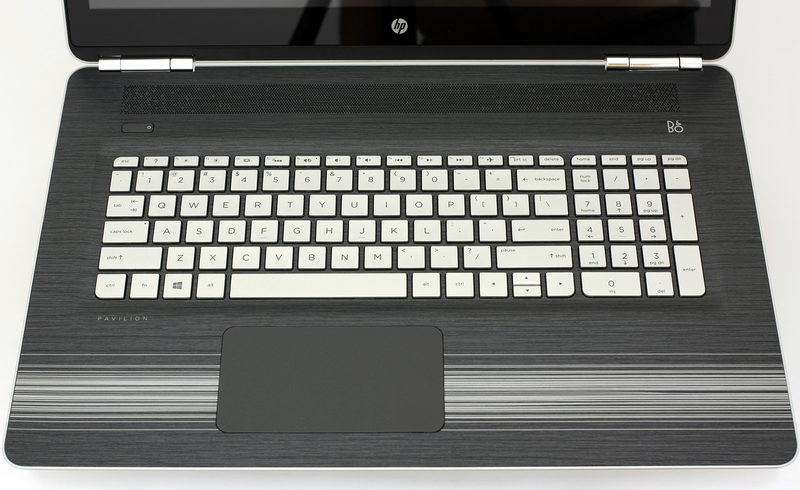 Is this a review of the HP 17-ab051sa i7 model? If not, could you please provide a link to correct review page. 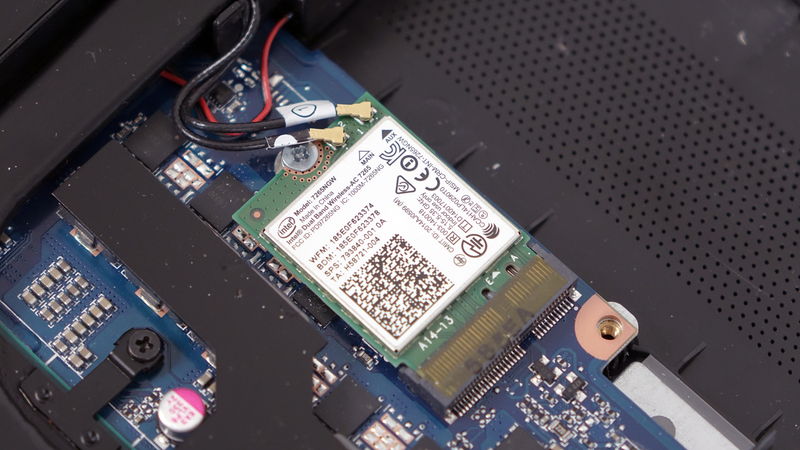 With the bios rev F.09 the SSD NVME PCI-Express work perfectly!